The optical sensor is the element that detects the laser radiation and converts the optical signal (photons) into electrical. In addition, the optical sensor needs a meter that correlates the electrical signal with the value of the optical magnitude to be measured (power, energy, or even pulse duration). We can offer easy-to-use, intuitive and ergonomic meters for laser power and energy sensor heads. The meter accepts all our power and energy sensors. In addition, these meter consoles can be connected via USB to the PC to analyze and process the data. But if you prefer, we can offer you the sensors with direct connection via USB or RS to the PC, eliminating the need for the meter (more economical, less versatile). 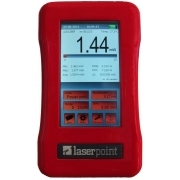 And all this from the expert in laser power and energy measurement: LaserPoint. If you work with lasers, remember our laser protection and safety section.